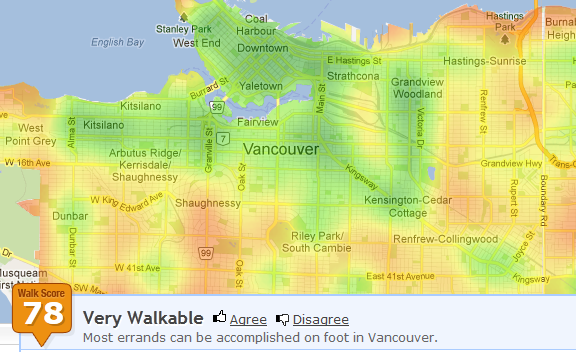 Vancouver has been ranked the most walkable city in all of Canada by Walkscore, a Seattle-based urban app company which compared over 300 Canadian cities and communities. With a Walkscore of 78, Vancouver placed ahead of other leading cities including Toronto (71), Montreal (70), Mississauga (59), and Ottawa (54). Vancouver’s best-scoring neighbourhoods for walkability were Downtown (96), the West End (94), Strathcona (93), Kitsilano (89) and Fairview (89).